Articulated, single-purpose truck for molten slag handling, updated with ultramodern cab designed for optimum operator safety and comfort. 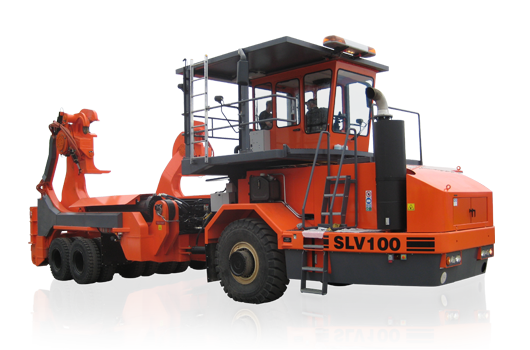 The Slag Hauler SH60 is a dedicated single-purpose truck designed to handle individual slag pots. The truck lifts, transports, tips and deskulls the pot without external assistance. The truck picks up the pot from the ground, a transfer car or a platform, and empties the pot by inverting it 180°. Typical transport is from the furnace to a cooling station or directly to the slag pit. The truck can be delivered with a slag pot – a complete solution for efficient molten slag operations. Slag trucks around the world operate in a high-risk environment and it’s not unusual that the tires of a slag truck catch fire. Thanks to our fire preventive design, this has never happened to any of our truck models. Despite hundreds of thousands of hours in service. 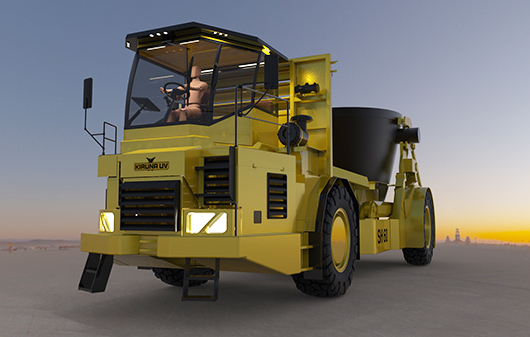 The Slag Hauler SLV100 has a heavy load capacity and is designed with modern life cycle costs in mind. The frame structure is made to withstand 30 years of heavy duty operation. The truck picks up the pot from the ground, a transfer car or a platform, and empties the pot by inverting it 180°. Typical transport is from the furnace to a cooling station or directly to the slag pit. Hest shield and protective canopy. Hydraulic lines shielded from heat and splash in frame structure. Low recovery costs through efficent skull removal.